I had lots of fun with this week’s sketch – I actually made a birthday card for my best friend (we’re celebrating today – Saturday – which is when I’m typing this post). I just love this stamp set “Just Kidding“! It fits my sense of humour to a ‘T’! Plus the fact that my friend Susan & I have been friends since we were teenagers (just a *few* years ago – LOL! ), this sentiment set makes it more funny 🙂 We often talk about what we’ll be doing as ‘old ladies’ together; with our ‘sturdy shoes’ and sense of adventure, I know we’ll still be having lots of fun together! 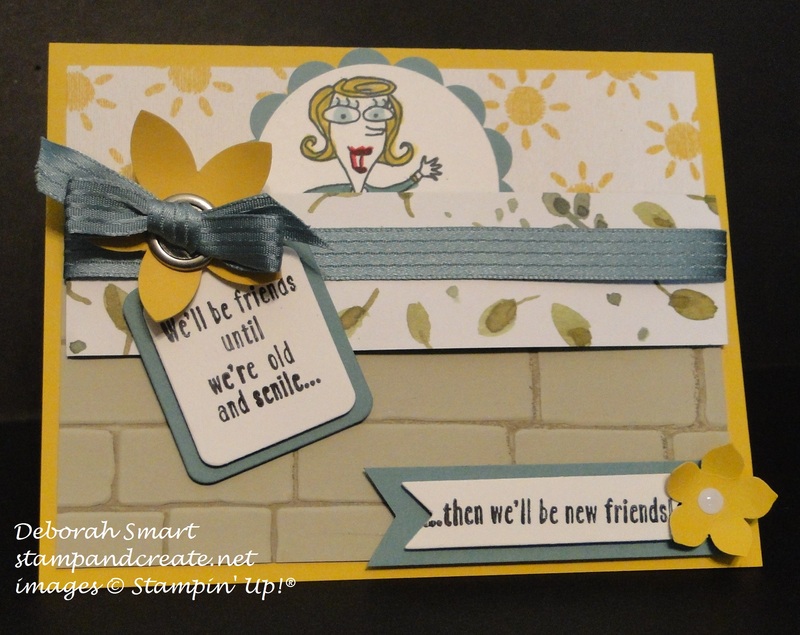 I started with a card base of Hello Honey, and layered the top portion of the card base with a piece from the retired Lullaby Designer Series Paper – I like those happy suns! I then used the new Brick Embossing Folder and a piece of Sahara Sand cardstock for the bottom. First, I applied Crumb Cake ink to the ‘mortar’ side of the embossing folder by dragging the ink pad gently across the folder. Then I placed the cardstock in the middle, and ran it through the Big Shot as normal. By applying the ink onto this side, it makes the mortar appear darker than the ‘bricks’. (if you were to apply the ink to the opposite side of the folder – the debossed side – then your bricks would appear darker than the mortar). I stamped the lady (on the couch) image onto a piece of Whisper White cardstock in Memento black ink, then added colour using my Blender pen and ink pads in Hello Honey, Lost Lagoon and Real Red. I then used the 2″ Circle Punch to cut it out, and the 2 3/8″ Scallop Circle punch for the Lost Lagoon piece behind it. The sentiments were stamped in Memento black into also onto Whisper White cardstock; for the tag shape, I used the new Tags & Labels Framelits to die cut them with the Big Shot; the other sentiment was cut using the Trimmer and Banner Triple Punch for the ends. After layering the cardstocks and image, I placed a piece of the new English Garden DSP across where the 2 papers join (the total look reminded me of someone leaning across a fence, to talk to their neighbour), with a piece of retired 3/8″ Stitched Ribbon in Lost Lagoon. I added a retired ribbon slide under the bow, then a retired punched flower; for the bottom sentiment I added a Petite Petals punched flower in Hello Honey, with a White Pefect Accent in the middle. 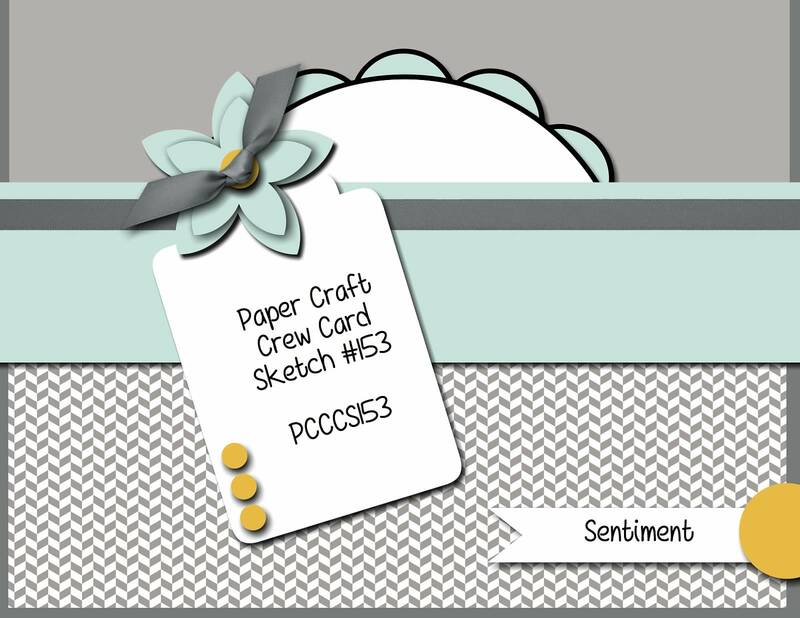 I hope you enjoyed my card – I’ll let you know how my friend liked it 🙂 Now I hope you’ll head on over to the Paper Craft Crew page – check out what the rest of the design team has made for your inspiration, and join in the fun! We’d love to see your card, based on the sketch! Previous Previous post: New Weekly Deals! 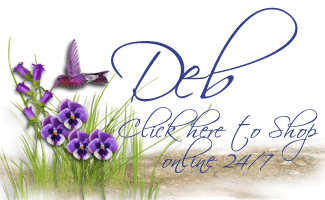 Next Next post: Wacky Watercooler Blog Hop – Christmas in July & More! It was a fabulous birthday card. I loved it ! !